Henry Purcell, (September 10, 1659 – November 21, 1695), a masterful Baroque composer, is generally considered to be one of England's greatest composers. Indeed, he has often been called England's finest native composer. Purcell incorporated Italian and French stylistic elements but devised a peculiarly English style of Baroque music due to his copious following of the English language inflection in texts, recitatives, and songs to develop a true English meaning and feeling. English folk songs are also vibrantly reflected in Purcell's songs, operas, and instrumental ensembles. To Purcell, the partnership of his country and world music unified his core value—to contribute to society—a society which ranked him as an international musician until the twentieth century. Purcell was born in Saint Ann's Lane, Old Pye Street, Westminster. His father, Henry Purcell was a gentleman of the Chapel Royal, and sang at the coronation of King Charles II of England. Henry the elder had three sons, Edward, Henry, and Daniel. 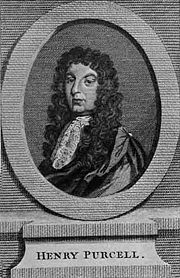 Daniel Purcell (d. 1717), the youngest of the brothers, was also a prolific composer. After his father's death in 1664, young Henry Purcell was placed under the guardianship of his uncle, Thomas Purcell (d. 1682), who showed him great affection and kindness. Thomas was himself a gentleman of His Majesty's chapel, and arranged for Henry to be admitted as a chorister. Henry studied first under Captain Henry Cooke (d. 1672), master of the children, and afterwards under Pelham Humfrey (d. 1674), Cooke's successor. Purcell is said to have been composing at nine years old; but the earliest work that can be certainly identified as his is an ode for the King's birthday, written in 1670. (The dates for his compositions are often uncertain, despite considerable research). After Humfrey's death, Purcell continued his studies under Dr. John Blow. He attended Westminster School and in 1676 he was appointed organist, at Westminster Abbey and in the same year he composed the music to John Dryden's Aureng-Zebe, and Thomas Shadwell's Epsom Wells and The Libertine. These were followed in 1677 by the music to Aphra Behn's tragedy, Abdelazar, and in 1678 by an overture and masque for Shadwell's new version of William Shakespeare's Timon of Athens. The chorus "In these delightful pleasant groves" from The Libertine is still performed. In 1679, he wrote some songs for John Playford's Choice Ayres, Songs and Dialogues, and also an anthem, the name of which is not known, for the Chapel-Royal. From a letter written by Thomas Purcell, and still extant, we learn that this anthem was composed for the exceptionally fine voice of the Rev. John Gostling, then at Canterbury, Kent, but afterwards a gentleman of His Majesty's chapel. Purcell wrote several anthems at different times for this extraordinary voice, a basso profondo, which is known to have had a range of at least two full octaves, from D below the bass staff to the D above it. The dates of very few of these sacred compositions are known; perhaps the most notable example is the anthem "They that go down to the sea in ships." In thankfulness for a providential escape of the King from shipwreck, Gostling, who had been of the royal party, put together some verses from the Psalms in the form of an anthem, and requested Purcell to set them to music. The work is a very difficult one, including a passage which traverses the full extent of Gostling's voice, beginning on the upper D and descending two octaves to the lower. In 1680, John Blow, who had been appointed organist of Westminster Abbey in 1669, resigned his office in favor of his pupil, who was still only twenty-two. Purcell now devoted himself almost entirely to the composition of sacred music, and for six years severed his connection with the theater. However, during the early part of the year, probably before taking up his new office, he had produced two important works for the stage, the music for Nathaniel Lee's Theodosius and Thomas D'Urfey's Virtuous Wife. The composition of his opera Dido and Aeneas, which forms a very important landmark in the history of English dramatic music, has been attributed to this period, though its earliest production has been shown by W. Barclay Squire to have been between 1688 and 1690. It was written to a libretto furnished by Nahum Tate, at the request of Josiah Priest, a professor of dancing. It is considered the first genuine English opera. Although it owes much to earlier semi-operas and masques, especially Blow's opera, Venus and Adonis, there is no spoken dialogue, but instead the action progresses in recitatives. Dido and Aeneas never found its way to the theatre, though it appears to have been very popular among private circles. It is believed to have been extensively copied, but only one song was printed by Purcell's widow in Orpheus Britannicus, and the complete work remained in manuscript until 1840, when it was printed by the Musical Antiquarian Society, under the editorship of Sir George Macfarren. Soon after Purcell's marriage, in 1682, on the death of Edward Lowe, he was appointed organist of the Chapel-Royal, an office which he was able to hold simultaneously with his position at Westminster Abbey. His eldest son was born in this same year. His first printed composition, Twelve Sonatas, was published in 1683. For some years after this he was busy in the production of sacred music, odes addressed to the king and royal family, and other similar works. In 1685 he wrote two of his finest anthems, I was glad and My heart is inditing, for the coronation of King James II of England. In 1687, he resumed his connection with the theater by furnishing the music for Dryden's tragedy, Tyrannick Love. In this year Purcell also composed a march and quick-step, which became so popular that Lord Wharton adapted the latter to the fatal verses of Lillibullero; and in or before January 1688 he composed his anthem Blessed are they that fear the Lord, by express command of the King. A few months later he wrote the music for D'Urfey's play, The Fool's Preferment. In 1690, he wrote the songs for The Tempest, Dryden's version of Shakespeare's The Tempest, including Full fathom five and Come unto these yellow sands, and the music for Thomas Betterton's adaptation of the playwrights, John Fletcher and Massinger's Prophetess (afterwards called Dioclesian) and Dryden's Amphitryon. In 1691, he produced his dramatic and operatic masterpiece, King Arthur, also written by Dryden, and first published by the Musical Antiquarian Society in 1843. In 1692, he composed songs and music for The Fairy-Queen (an adaptation of Shakespeare's A Midsummer Night's Dream), the score of which was rediscovered in 1901 and published by the Purcell Society. Purcell's Te Deum and Jubilate was written for Saint Cecilia's Day, 1693, the first English Te Deum ever composed with orchestral accompaniment. This work was annually performed at St Paul's Cathedral until 1712, after which it was performed alternately with George Frideric Handel's Utrecht Te Deum and Jubilate until 1743, when both works were replaced by Handel's Dettingen Te Deum. He composed an anthem and two elegies for Queen Mary II's funeral. Besides the operas and semi-operas already mentioned, Purcell wrote Don Quixote, Boudicca, The Indian Queen, and others, a vast quantity of sacred music, and numerous odes, cantatas and other miscellaneous pieces. He died at his house in Dean's Yard, Westminster, in 1695, at the height of his career; he was only in his mid-thirties. His wife and three of his six children survived him. His widow died in 1706, having published a number of his works, including the now famous collection called Orpheus Britannicus, in two volumes, printed in 1698 and 1702 respectively. Purcell is buried adjacent to the organ in Westminster Abbey. His epitaph reads: "Here lyes Henry Purcell Esq., who left this life and is gone to that blessed place where only his harmony can be exceeded." A Purcell Club was founded in London in 1836 for promoting the performance of his music, but was dissolved in 1863. In 1876 the Purcell Society was founded, which published new editions of his works. 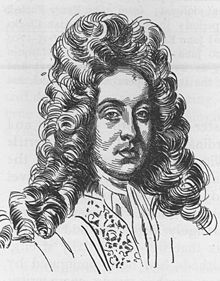 After his death, Purcell was honored by many of his contemporaries, including his old friend John Blow, who wrote "An Ode, on the Death of Mr. Henry Purcell (Mark how the lark and linnet sing)" with text by his old collaborator John Dryden. Indeed, John Blow retook his old position as organist at Westminster Cathederal that he had stepped down from, in favor of his pupil. The English poet Gerard Manley Hopkins wrote a famous sonnet entitled simply "Henry Purcell," with a head-note reading: "The poet wishes well to the divine genius of Purcell and praises him that, whereas other musicians have given utterance to the moods of man's mind, he has, beyond that, uttered in notes the very make and species of man as created both in him and in all men generally." A modern day Purcell Club has been created, and provides guided tours and concerts in support of Westminster Abbey. Purcell is among the Baroque composers who has had a direct influence on modern rock and roll; according to Pete Townshend, guitarist for The Who, Purcell was among his influences, particularly evident in the opening bars of The Who's Pinball Wizard. The title song from the sound track of the film A Clockwork Orange is from Purcell's Music for the Funeral of Queen Mary. Purcell also had a strong influence on the composers of the English musical renaissance of the early twentieth century, most notably Benjamin Britten, who created and performed a realisation of Dido and Aeneas and whose Young Person's Guide to the Orchestra is based on a theme from Purcell's Abdelazar. Stylistically, the aria I know a bank from Britten's opera A Midsummer Night's Dream is clearly inspired by Purcell's aria Sweeter than Roses, which he wrote as part of incidental music to Dryden's Pausanias. All links retrieved December 18, 2017. This page was last modified on 18 December 2017, at 17:00.